UFC 228: Where is the respect for Tyron Woodley? When you look at the portfolio of UFC welterweight champion Tyron Woodley, it is quite impressive. He’s 18-3-1 with 11 of those wins coming via stoppage and nine in the first round. Woodley’s charismatic, charming and handsome. He’s appeared in seven movies, two television shows, hosts his own podcast and appears every Friday on a video web series on YouTube for TMZ Sports titled “Hollywood Beatdown”. The channel has over 428,000 subscribers and over 1.5 million views in 52 episodes. Yet, when it comes down to securing the “money fights” that fighters have been seeking, for one reason or another, Woodley is left on the sidelines. It’s not due to a lack of trying by the Missouri native. He’s called out the household names of the sport early and often, but to no luck. Instead of facing opponents who will get him to the upper echelon of the sport, Woodley feels that the UFC is only offering him fighters that the promotion would like to see succeed more than him. That trend continues Saturday at UFC 228 when Woodley defends his title against England’s Darren Till in the main event of the show. “The way the game is, there is no set ground rules,” Woodley tells Sporting News. “There’s some fighters that can call out different fighters and people can get behind it. Sometimes when the fans get behind it, those are the same fans that are buying the pay-per-views and the UFC might get behind those fighters. Based off of history, I’m not one of those guys. I say I want to fight Conor (McGregor), I want to fight (Michael) Bisping, Nick and Nate Diaz and Georges St-Pierre. I can’t really do that because people want to me fight under the new rules. The point Woodley makes is a valid one. In his three title defenses, he’s faced Thompson twice and Demian Maia. After the Maia bout at UFC 214 in July 2017, Woodley went on to have shoulder surgery for a torn labrum. While on the sidelines, the UFC made an interim title fight between Covington and Rafael dos Anjos at UFC 225 even though he was close to returning to action. All things considered, Woodley could put his foot down and demand to face McGregor, St-Pierre or one of the Diaz brothers rather than another up-and-coming talent who is looking to have their status raised at the expense of Woodly. For Woodley to reach the pinnacle of the MMA world, he needs to keep making definitive statements every time he steps inside the Octagon, whether people like it or not. 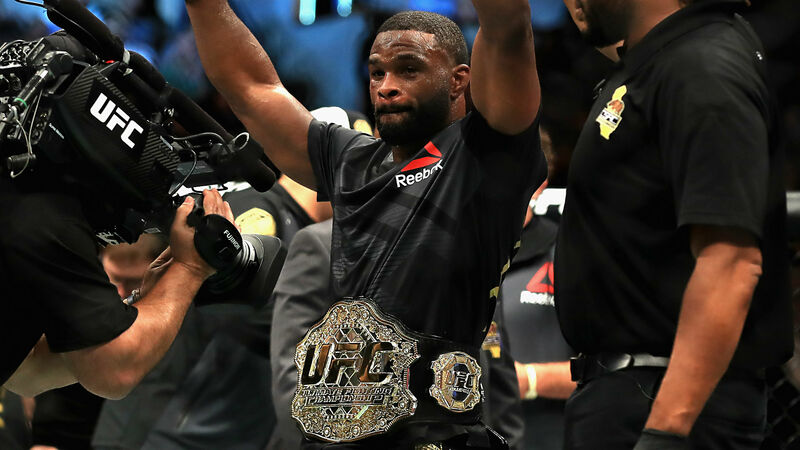 Rather than display the fireworks of his highlight reel finishes of Robbie Lawler and Josh Koscheck, Woodley has taken a more cerebral approach in his recent fights. His welterweight title defenses against Maia and two fights with Thompson were far from crowd-pleasing and drew criticism from fans as well as UFC president Dana White. At this point, all Woodley can do is be himself. And if being himself includes numerous title defenses, perhaps that is what will eventually get the 36-year-old the big money fight that he has desired.